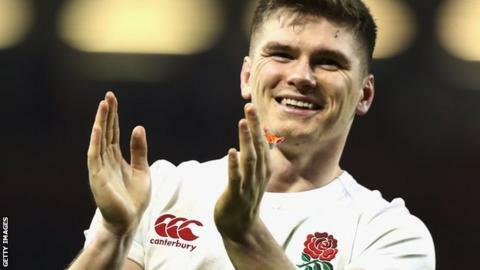 Owen Farrell has hailed the "brilliant and constant" guidance from retired World Cup winner Jonny Wilkinson as he prepares to win his 50th England cap. Former fly-half Wilkinson, 37, has been a consultant on Eddie Jones' coaching staff over the past year. Farrell, 25, told Radio 5 live: "It's brilliant working with him, he has a massive understanding of everything we are going through as players." England host Italy on Sunday in the Six Nations seeking a 17th straight win. And Farrell said he has no doubt he has benefited from working with Wilkinson, who is England's record points scorer with 1,179, more than double the total of second-placed Farrell. "You can speak to him whenever. [The advice] is pretty constant. [I've learned] quite a bit, as you would imagine," he said. Farrell broke into the Saracens first team as a teenager in 2008, the same year current England forwards coach Steve Borthwick joined the club. Borthwick said he knew straight away Farrell's competitive nature meant he was destined for greatness. "As soon as I met him and saw him around the club as a youngster, with the competitive desire he had then and still has now, he was always going to have a great future in the game," said Borthwick. "The work he has put in over the years to get to the player he is now is fantastic, and shows the character of the guy. All the respect and accolades he gets are richly deserved." Farrell admitted he has been a driven character for as long as he can remember, following in the steps of his father Andy, himself a dual-code rugby international and now Ireland's defence coach. "My dad never let me win at anything. That was probably more to do with it," Farrell said. "I was always competitive. Probably too competitive at times when I was younger. I've always been that way inclined." Farrell believes he has improved significantly since making his debut. Since making his debut under Stuart Lancaster in the Six Nations in 2012, Farrell has scored 562 points in an England shirt, and has assumed the role of vice-captain under skipper Dylan Hartley. Over the course of 2016 Farrell overtook both Rob Andrew and Paul Grayson in the list of England all-time points scorers, but the 25-year-old said he is not motivated by personal records. "I am not really too aware of them, it's only when things come around that people tend to talk about them," he added. Farrell said he has learned from difficult times in his career, and believes he is a much improved player since he made his debut. "You like to think you have improved in most areas, and learned from experience," he said. "Hopefully from the start of my career to where I am now, I am miles away." Listen to the latest Six Nations news on BBC Radio 5 live between 21:00 and 22: 00 GMT on Thursday.